Seven out of the Ten measures used in the Child Poverty Reduction Act 2018 were introduced to New Zealand by the New Zealand Poverty Measurement Project (NZPMP) jointly led by Charles Waldegrave (FCSPRU) and Bob Stephens (School of Government, Victoria University of Wellington). A Technical report for the Office for Seniors within the Ministry of Social Development. Five-year Measurement Review Report by Charles Waldegrave, Peter King and Michaela Urbanová. The 2018 Living Wage is $20.55, $4.05 above the new (1 April 2018) minimum wage. The Families Package has lowered the expected level of the living wage for 2018. If it was not forthcoming, then the hourly rate would be $22.45 instead of $20.55. A report for the New Zealand Housing Foundation. First presentation of findings. Work in progress to be completed this year. Waldegrave, C. (2012) “Developing a ‘Just Therapy’: Context and the Ascription of Meaning”, in A. Lock and T. Strong (Eds) Discursive Perspectives in Therapeutic Practice. Oxford University Press. Waldegrave, C (2009) “Cultural, Gender and Socio-economic Contexts in Therapeutic and Social Policy Work” Family Process, vol.48(1). New York. Waldegrave, C. (2007) “Reflections on the Implications of Indigenous Notions of Peace and Conflict Resoltuion for the Church and Political Society” in T.T. Tamasese, T.M. Suaalii-Sauni, B. Martin, M. Henare, J.P. Te Paa and T.K. Tamasese (Eds) Pacific Indigenous dislogue on Faith, Peace, Justice and Good Governance. Apia, Samoa: University of the South Pacific. Waldegrave, C (2006) “Cultural, Gender and Socio-economic Contexts in Therapeutic and Social Policy Work” Proceedings of the National Family and Parenting Institute ‘Parent Child Conference 2006, London, United Kingdom. Waldegrave, C. (2006) “Stakeholder Consultations in Ageing Research.” EWAS Working Paper Series: Working Paper No. 7. 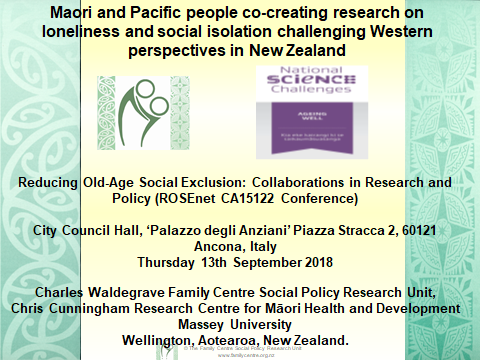 /The Family Centre Social Policy Research Unit and The University of Waikato Population Studies Centre. Link. Waldegrave C, (2006) “Contrasting National Jurisdictional and Welfare Responses to Violence to Children”, Social Policy Journal of New Zealand, 27, (March). Salmond C, Crampton P, King P and Waldegrave C (2006) “NZiDep: A New Zealand Index of Socioeconomic Deprivation for Individuals” Social Science and Medicine, Vol 62 (6), March, pp Pages 1474-1485. Tamasese K; Peteru C and Waldegrave C. (2005) “Ole Taeao Afua, The New Morning: A Qualitative Investigation into Samoan Perspectives on Mental Health and Culturally Appropriate Services.” Australian and New Zealand Journal of Psychiatry. Vol. 39 (4) April, p.300. King, P and Waldegrave C. (2003) “Social Capital, Social Networks, and Access to Employment.” New Zealand Population Review. 29(1). Waldegrave, C; Stephens, R; and King, P. (2003) “Assessing the Progress on Poverty Reduction.” Social Policy Journal of New Zealand. 20 (June). Waldegrave, C; Stephens, R; and King, P. (2003) “Gauging New Zealand’s success at Poverty Reduction in the New Millennium.” Australian Journal of Social Issues. 38(4): 433-463. Morrison P, and Waldegrave C (2002) “Welfare Reform and the Intra-regional Migration of Beneficiaries in New Zealand” Geoforum, 33. Waldegrave C and Pole N (2001) “Taking Our Opportunities: Social Cohesion and the Knowledge Divide in Aotearoa, New Zealand” in The Proceedings of the Catching the Knowledge Wave Conference held in Auckland 1–3 August 2001, Theme Papers, Social Cohesion and the Knowledge Divide (Paper two). View pdf file. Waldegrave C and Stephens R (2000) “Poverty: The Litmus Test of Social and Economic Policy Failure” in Conference Proceedings of the Second Bienniel Aotearoa New Zealand International Development Studies Network (DEVNET) Conference 17 – 19 November 2000 at Victoria University of Wellington. DEVNET, Wellington. Tamasese K, King P and Waldegrave C (2000) “Use of Section 16 by Pacific Peoples: Case Studies Seven to Nine.” In Speaking about Cultural Background at Sentencing: Section 16 of the Criminal Justice Act. Wellington: Ministry of Justice. Link. Waldegrave C, Stephens R and Frater P (1996) “Most Recent Findings In The New Zealand Poverty Measurement Project” Social Work Review, 8 (3), September, Dunedin, New Zealand. Waldegrave C and Stuart S. (1996) “An Analysis Of The Consumer Behaviour Of Beneficiaries” Social Work Review , 8 (3), September, Dunedin, New Zealand. Waldegrave C and Stuart S (1996) Report Prepared for Te Puni Kokiri Social Analysis Portfolio Housing Research Project Component i “Housing Disadvantage and Maori in Aotearoa/New Zealand: A Review of the Literature Since 1980” Component ii “Maori Responses to Changes In State Housing: A Survey of the Issues, Choices and Experiences” Component iii (with Catherine Love) “Maori Responses to Changes In State Housing II: A Qualitative Look at the Issues, Choices and Experiences” The Ministry of Maori Development, Wellington. Waldegrave C. (1996) “Health and Poverty in New Zealand” in The Proceedings of the New Zealand Hospital Dental Surgeons’ Association Conference 26 – 27 July 1996, Wellington. Waldegrave C.T. & Frater P.(1996) “New Zealand: A Search for a National Poverty Line” in Poverty: A Global Review Handbook in International Poverty Research eds Oyen E., Miller S., Samad S., Scandinavian University Press, Oslo. Stephens R., Waldegrave C., & Frater P.(1995) “Measuring Poverty in New Zealand” Social Policy Journal of New Zealand, 5, December. Link. Waldegrave C.T. (1994) “Measuring Poverty in New Zealand: Rights and Responsibilities”, Papers from the International Year of the Family Symposium on Rights and Responsibilities of the Family held in Wellington 14 to 16 October 1994, pp 85-93. The International Year of the Family Committee in association with the Office of the Commissioner for Children. Waldegrave C.T. (1994) “Who Researches What in Housing?” in Housing Research Conference Proceedings, 17-18 May, 1994, Ministry of Housing. Waldegrave C. & Sawrey R. (1993) The Extent of Serious Housing Need in New Zealand 1992 & 1993 Social Policy Unit, The Family Centre, Lower Hutt. View pdf file. Waldegrave C.T. (1992) “The Family: Morality Versus Economic Reality” in Eds. Novitz D.& Willmott B. New Zealand in Crisis, Government Print. Waldegrave C.T. (1991) “Full Employment, Equity, Participation and a Viable New Zealand Economy” in Ed. Pelly R. Towards a Just Economy. , The Combined Chaplains’ Victoria University of Wellington. Waldegrave C.T. (1991) “Budget ’91: Monetarist Dream Citizen’s Nightmare” Social Work Review 4,2 & 3 pp 33-34. Waldegrave C.T. (1989) “Poverty – A Blasphemy In New Zealand” Waikato University, New Zealand. Waldegrave C.T. (1989) “Enemies, Friends Or Partners?” in “1840 – 1990. In Ed. Newnham T.A. Long White Cloud?. Graphic Publications. Waldegrave C. & Coventry R.(1987) Poor New Zealand: An Open Letter on Poverty. Platform Publishing. Waldegrave C.T. (1984) “Who pays for the Economic Reconstruction?” in Economic Summit Conference Proceedings and Conference Papers Vol.2. Government Print. Jacobi H., Coventry R., & Waldegrave C.(1983) “A Study of Homeless Families in the Hutt Valley.” In National Housing Seminar, Massey University Students Association, New Zealand pp 149-157. Waldegrave C.T., (1982) “Social Planning and the Practitioner” in National and Regional Planning and Policy Relationships. Town and Country Planning Division, Ministry of Works and Development. Waldegrave C., Coventry R. (1981) Unemployed School Leavers, Their Feelings, Their Experiences, and Their Suggestions. 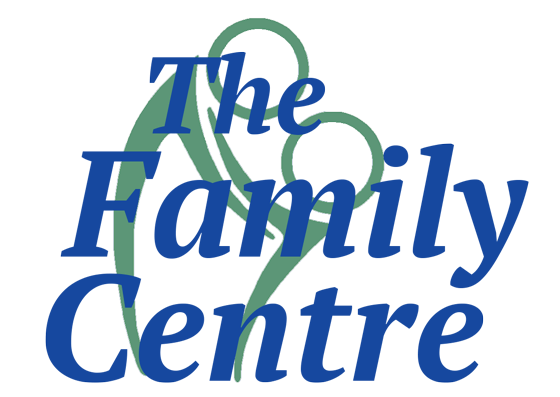 Reprints The Family Centre, P O Box 31 050, Lower Hutt. Waldegrave C ( 2005) “ ‘Just Therapy’ with Families on Low Income” Child Welfare, (Child Welfare League of America) Vol 84 (2), March/April, pp265 – 276. Waldegrave C. & Tamasese K.(1994) “Some Central Ideas in the ‘Just Therapy’ Approach” Reprinted in Human Systems: The Journal of Systemic Consultation and Management Vol. 5 Issues 3 and 4, United Kingdom. Waldegrave C. & Tamasese K.(1994) “Some Central Ideas in the ‘Just Therapy’ Approach” Reprinted in The Family Journal (The Official Journal of the International Association of Marriage and Family Counsellors) Vol. 2, No 2, April, U.S.A.
Waldegrave C.T. (1993) “The Challenges of Culture to Psychology and Post Modern Thinking” in Cultural Justice and Ethics, Proceedings of a Symposium held at the Annual Conference of the New Zealand Psychological Society, University of Victoria, Wellington, 23 August 1993, ed. Linda Waimarie Nikora, Psychology Department, University of Waikato, Private Bag 3105, Hamilton, New Zealand. Tamasese K. & Waldegrave C.(1993) “Cultural and Gender Accountability in the ‘Just Therapy’ Approach” The Journal of Feminist Family Therapy 5(2) Summer. Waldegrave C. & Tamasese K.(1993) “Some Central Ideas in the `Just Therapy’ Approach” Australia and New Zealand Journal of Family Therapy. 14(1): pp 1-8. Waldegrave C.T. (1992) “Psychotherapy, Politics and the Loss of the Welfare State” NZ Association of Psychotherapists Newsletter. Sept. pp 1-13. Waldegrave C.T. (1992) “Psychology, Politics and the Loss of the Welfare State” NZ Psychological Society Bulletin. 74, Oct.
Waldegrave C.T. (1990) “Just Therapy” Dulwich Centre Newsletter No. 1: pp 5-46, Adelaide, Australia. Waldegrave C.T. (1990) “The Politics of Empowering Families – Just Therapy” in Strengthening Families Monograph of 1990 Washington D.C. Annual Conference Plenary Presentations, American Association of Marriage and Family Therapy. Waldegrave C.T. (1985) “Mono-Cultural, Mono-Class, and So Called Non-Political Family Therapy.” Australia and New Zealand Journal of Family Therapy6 (4): pp 197-200. Waldegrave C.T., (1982) “Social Planning and the Practitioner” in “National and Regional Planning and Policy Relationships.” Town and Country Planning Division, Ministry of Works and Development.